The GV Summit session on Diaspora influence online exposed the diversity of experiences between countries and the need to take into consideration important gaps in communication, worldview, political and economic conditions between various communities of common heritage who strive to work together. Iranian Diaspora played important role to pass the message about events within the country, via different social networks to the wider world, and had some impact on the people in the home country. For instance, demonstrators printed and displayed caricatures by exiled cartoonist. But sometimes, the diaspora is trapped in its own bubble, and pushes ideas before their time has come, like when “strategists” inciting protests via Facebook, in effect resulted in informing the police which monitores social networks. The police were the only one to show op on the spot. This resulted in no protests that time, but also after. When considering the role of the diaspora, one has to consider the important disconnect with the everyday survival worries of the people within the country (inflation, rising prices etc. ), Petrossian stressed. Kenyan blogger and activist Nanjira Sambuli spoke started her contribution by exposing the “call Washington” mentality of the Kenyan diaspora: instead of asking about what's going on in the country, they would rather ask the local embassy. 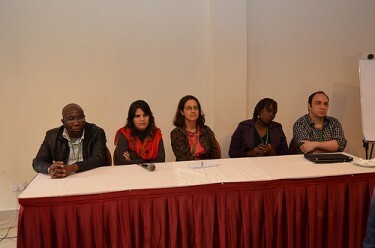 Kenyan diaspora members mainly communicate between themselves via forums, which are very segmented, and evolved from mailing lists set up by students abroad. The online communities based within Kenya and the diaspora are mostly disconnected. There are blogs, but without mutual connections and sharing info between them. For instance, the diaspora bloggers rarely cite sources who are actually in the country. However, there are signs of improvement, especially when Diaspora people overcome their perception of superiority, because they are often economically better off than those who remained in Kenya. Last week, a protest in Nairobi “was first time for very closed Diaspora to go with the pulse on the ground and use social media…” together with people who actually took to the streets. Nanjira Sambuli concluded that there's room for improvement, if Diaspora can use new media to get over themselves and help the country in more ways than before. These connections can be of wider mutual benefit. For instance, the Diaspora people demand to be allowed to vote in Kenyan elections, and they currently run an online petition on this issue. The slow positive changes can reflect on both kinds of communities. Elaine Diaz, a journalism professor from University of Havana and a blogger, who spoke in Spanish with consecutive translation by the moderator, stressed that “in order to understand the relationship between Cuba and its Diaspora online, we need to understand the relationship between Cuba and the Diaspora offline. This relationship has been very difficult since 1959, when Castro came to power and large number of Cubans immigrated to USA. This relationship is about forming of opinions on both sides. Given the fact that in Cuba internet penetration is very low, about 14%, and limited mostly only to e-mail, it may seem that for most Cubans any online relationship with the people abroad is only a dream. However, this is not the case, as more people use social media (Facebook and Twitter), and blog, mainly using WordPress. According to prof. Diaz, as offline difficulties move online, it is hard to comprehensively access how the talk about Cuban reality crosses geographical boundaries. “Internet space has turned into political battlefield between Cubans in the country and out. The #Cuba hashtag is a space of open political battle between Government supporters and opponents. However there's a new generation of young internet users who are looking for new spaces to communicate to each other. In spite of political differences, even within this battlefield a few points of agreement arose: (1) demand for reform of migration framework in Cuba; (2) necessary to eliminate the need for exit permit to leave Cuba, and (3) the need to improve use of Internet on the island – issues of increasing access and penetration. The civil society demands access to the internet not only for private e-mail but also for active social political participation in public spaces in society, and decision making. From scholarly perspective these phenomena of points of consensus within the blogosphere can be observed over the Internet even by those who are not in Cuba. Gershom Ndhlovu, Zambian journalist living in the UK, said that in contrast [to Iran], the Zambian case is different – it is among the most democratic countries in Africa (it changed presidents 3 times in the last 20 years). The dominant emigration motive is economic, not political. According to him, the Diaspora is well-connected, and understands what's going on home. Its key issue is fighting for dual citizenship. At present Zambia is rewriting its Constitution, and Diaspora asks provision for dual citizenship. Most politicians support this motion, and the related initiative for the right to vote, but new president opposes it. After the moderator praised the speakers for sticking to time, a lively debate developed during the Q & A session. The first question from the audience was referring to improvement of communication opportunities between the Diaspora and home country. Does that make it easier for journalists and dissidents to leave, as they know they still can have influence back home? Petrossian replied that dissidents are usually forced into exile, and that they do not do it voluntarily for tactical reasons. Another member of the audience asked more information about the online movement of Kenyans who demand better representation of the country in the international media. As the media focus only on the bad side of events and perpetrate negative stereotypes, the people using #KOT (Kenyans on Twitter) hashtag are trying to change how people view Africa and Kenya in particular. Nanjira Sambuli responded by noting the case of CNN sensationalist reporting on “Violence in Kenya” (as if it engulfs the whole country) and their graphics of national flag burning within coverage of a recent bombing. Among other things, many Kenyans responded by sharing a Youtube video with recording of a Kenyan phoning CNN and telling them off. Besides commercial media, she also addressed the issue of official Advisories against travel in Kenya. As they also miss the full picture, the Diaspora can help amplifying the information about the facts on the ground and provide foreigners with more comprehensive accounts. Matisse Bustos Hawkes addressed the issue of people from the Diaspora who become famous and are promoted by the international media as all-purpose spokespersons. How do the larger communities, including people within the home countries, deal with this kind of representation? Sumburu said that “You cannot represent a community into which you are not tweeting in or facebooking in. If you do, you're not gonna get much love… It is good when international media find people on the ground to talk.” Similarly with diaspora opinions in blogs and newspapers: “ You cannot afford to be preachy” – nobody bothers to read condescending op-eds by diaspora representatives. They loose legitimacy because they do not engage into dialogue, “they never talk back when people discuss them online.” Kenyan people are moving away from non-interactive opinion-makers, towards new media which is based on credibility as being part of conversation. 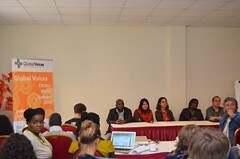 Kenyan audience member warned that one must have in mind generational differences in using various media. Demographics is very important and one must not overly generalize the practices of the online communities composed of mostly young people. Traditional media still have influence over other age groups. Elaine Diaz said that the question of representation is very interesting for Cuba. It is very difficult for Cubans living on the island to accept as representative voice someone living in Diaspora. “Majority thinks that we have to live, sleep, wake up in Cuba to experience its reality.” Adding to this, the moderator Susan Benesch noted the example of one of the threatened voices from Cuba. Blogger Yoani Sanchez was forced to immigrate to Sweden, but decided to return to Cuba as she also felt the widely held opinion that you have to live there to write about it. Another audience member asked if there's “Western pressure” to Diaspora persons to choose and “give voice” to the people living inside the countries. Petrossian retorted that the question needs to be turned upside down, as many diaspora Iranians actively seek foreign help from organizations and government institutions, seeking funding to create bridges with the voiceless people inside the country. One must focus on the needs inside the country, especially due to shortage of local sources, as the non-democratic countries are drained of people forced to flee. For instance, hundreds of journalists have left Iran in recent period. Ndhlovu again contrasted with the Zambian experience of practice of journalism in the Diaspora. For his coverage, he does not rely on the government, but uses other sources, from online to interviews for his internet radio-station. Zambian newspapers monitor the site to write stories, because the people has developed the confidence in the show. In conclusion, the moderator said that the theme that emerged from the session is that Diasporas and national communities present different kinds of people. To address their common interests and to communicate with each other better, they can benefit from reusing the positive experiences of creating worldwide communities composed of diverse individuals, for instance the development of the Global Voices community.